Categories > The Open Forum > In the News/Announcements > Harry Anderson has Died. I just read that too. I remember watching him on SNL when I was little. I loved the Harry the Hat character. Sad day for magic. Aw man... So sad. He wasn't that old a man, was he? (Rhetorical question, I can look him up.) Got to see him once at The Punchline in Atlanta a long time ago in a galaxy far, far away. What a showman! So sad. Harry was only 65. Wow! Really bummed out about this. I grew up watching him on TV, and always enjoyed his magic. Over the last few years I have purchased a number of his marketed items through Meir Yedid. Celebrate his life and magic with amazement and some laughs. He handed a lady in the front row a deck of cards, and asked her to “mix the deck.” She apparently didn’t understand, so he gestured with hand motions, a kind of overhand shuffle, again saying “Mix the deck.” After a couple more times, seeming to get more and more agitated at her inability to understand, he reached into his suitcase and produced a large plastic cruise ship with an egg beater, visibly demonstrating how to “mix the deck”. I guess you had to be there, but seen in context with the rest of his show, it was hilarious! This is very sad news to hear. To me he'll be the guy that did the Needle Thru Arm. I remember buying this as a dealer item and freaked my friends out and of course, he was the judge on Night Court. My first memory of him was when he did his hamster thing on SNL. I was wide eyed and smiling. It was impossible to not like him. Just have been got up (it is already tuesday morning here..) and the day is ruined. I remember to have watched "The Grappler" and his "Needle through arm" and I have laughed tears (what happens quite seldom..). And I remember the story where he performed for people on the street waiting in front of a cinema to see "Jaws" in 1972 (?). He took a big knife, held it on his arm and cut right through, the bone knacked, blood spouted out...and the audience got wild..ok, he had to run immediately (that´s what I remember, I think I read it in "Wise Guy")...sigh, my kind of humor...yeah, and his Harry the hat figure is just great. I´m really sad. Rest in Peace, Harry. 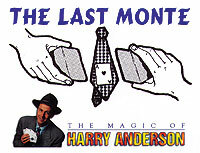 I think many of us always felt Harry the Hat was really Harry Anderson - He wasn't playing a part.